Please update this for DLC and MCM! Please don't let this amazing mod die!! Yes! I literally just found out today that MCM is available for Fallout 4, and it looks really good! I 100% intend to go back and redo FallComplete "properly" using MCM. I wish MCM had been available when I first made this mod, as that's the way it was always intended to be done. Ah, that's really nice to hear. I definitely look forward to the redone version of this. Author hasn't been active since May of 2016. I doubt this mod will be updated. Very sad. For the DLCs, there's not much magazine. U can use wiki to find it although I gotta admit this method is tedious and not convenient. Is there an ETA on the new version? @ kefka95; Great to hear! looking forward to it. Any ETA on this? Would love to finish my play-through of the DLC before 76 comes out. 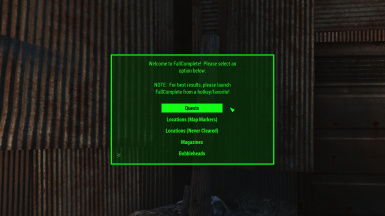 It is a little annoying when you put the FallLauncher or whatever holotape in a stash or whatever and it automatically gives you another one when you load in. 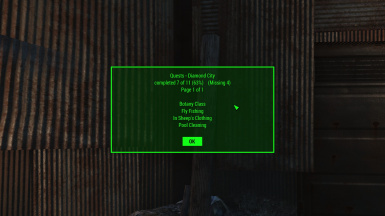 It is random for a holotape to be under the aids tab and thats one tab i like to keep clean. so discovered a possible bug. 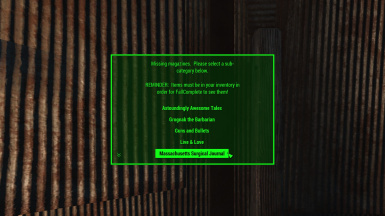 got the massachusetts surgical journal from the book return in boston public library, but fallout complete still places a quest indicator just in in front of the machine, even though i have the magazine and the machine says out of stock when I try to buy it. Tried dropping the mag and picking it up but the quest marker was still there. 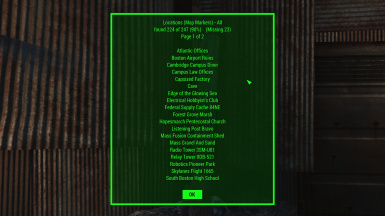 You can just use the Fallout 4 wiki to find out who give the quests and where. Any updates on the MCM update ? this and SkyComplete are both a must have in my load order, always, you are my hero for making them and I do hope to see more from you. This works great! 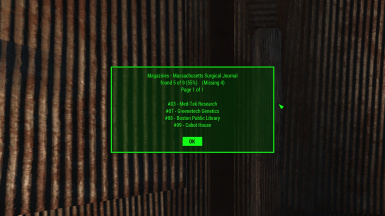 It's not perfect, some magazines are missing from where they should be but it keeps pointing to that area, but it's a very old save file so I have no idea what happened to it. Used console commands to spawn it eventually. This does exactly what I was hoping it would, thanks for the work. Great MOD. Been using this for more the 500hrs on my playthrough. So far, I have 1 question... 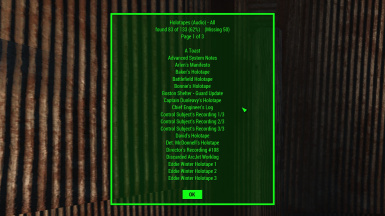 Seems that "MacCready for Action" is not really a quest... Is there a way to not include this in the quest list, or can some make a recommendation on how to remove this from the .PEX (FallComplete.pex) file? 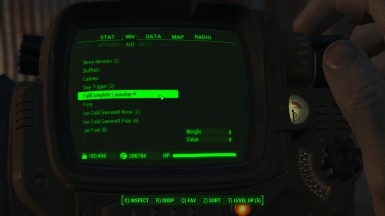 I have MacCready's Perk, but this quest, doesn't go away or get counted. Thank you again kefka95! Endorsed. Not completely useless, you can check with perks you own although you might not be able to know exactly which magazines for grognak, guns n bullets but you can still see how many u have left to find. Also useful for bobbleheads. 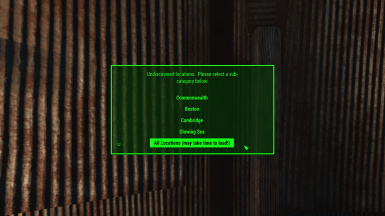 Is there any possibility for you to do an add-on to cover Tales from the Commonwealth, just like you did with Interesting NPCs in Skyrim?